After experiencing one of the best music festival experiences I’ve ever had earlier this year at New Orleans’ French Quarter Festival, I am returning to the cradle of jazz, this time to perform! 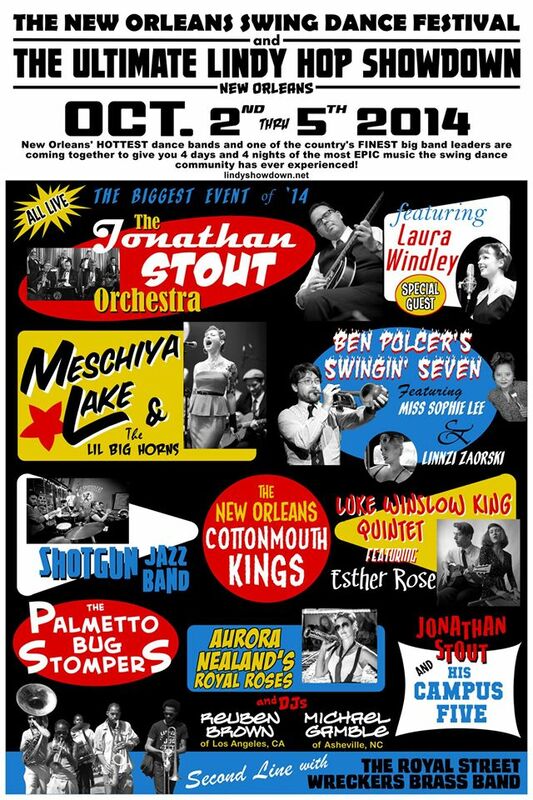 I’ll be in New Orleans with two of Jonathan Stout’s bands, the Campus Five and the Jonathan Stout Orchestra for the Ultimate Lindy Hop Showdown, October 4 and 5, 2014. On October 4, from 8:00 p.m. to midnight, the Jonathan Stout Orchestra will perform at the Civic Theater, New Orleans’ oldest theater, built in 1906. On October 5, from 1:00 p.m. to 5:00 p.m., Jonathan Stout and his Campus Five will be at NOLA’s famous French Market (at Dutch Alley). On top of these performances, ULHS will feature performances by some of New Orleans’ finest swing and traditional jazz bands and musicians – Ben Polcer’s Swinging Seven, Meschiya Lake and the Little Big Horns, Luke Winslow King Quintet, Aurora Nealand and the Royal Roses, Palmetto Bug Stompers, New Orleans Cottonmouth Kings, and the Shotgun Jazz Band. See you in NOLA!